Experts on superconducting radiofrequency technologies (SRF) from all over the world came to SLAC, USA, from 1 to 4 December to the Tesla Technology Collaboration (TTC) meeting. It was the very first TTC Meeting for SLAC to host and the lab used the opportunity to not only invite experts to their lab but also encouraged their own employees to attend this meeting. “With LCLS-II using this technology we wanted SLAC staff to ‘comfortably’ attend in spite of them being relative newcomers,” explains Marc Ross, project manager for LCLS-II at SLAC. “I think it worked and we had an unusually exciting meeting for everyone involved in SRF.” And within the TTC community many ILC enthusiasts were delighted by the meeting and to see the progress in this field. In his opening talk the TTC Chair, Hasan Padamsee, called the recent developments the beginning of a Golden Age of SRF technology. “With the rapidly growing recognition from the accelerator community of the significant benefits that SRF has to offer to high energy physics, nuclear physics, materials science and accelerator-driven systems with high-power proton beams, the golden era of SRF enables a wide range of exciting new applications all over the world.” And in the same light the plenary presentations followed: many labs showed their advances for big and small projects all around the globe. In the usual spirit of TTC meetings the following days included working groups which not only gave scientists the opportunity to present their work, but left plenty of time to discuss experimental results, theoretical models and technical solutions. In the Cavity Working Group high quality factors and therefore nitrogen doping and magnetic flux expulsion, and field emission measurements were thoroughly discussed. High quality factors (Q) are desirable for keeping the refrigeration cost as low as possible. Therefore maintaining high Qs throughout the running time of the machine is as important. Especially the nitrogen doping of cavities has shown to produce high quality factors. “I thought the most interesting part was that all three labs came up with the same conclusion independently,” explains Ari Palczewski, staff scientist at Jefferson Laboratory. “Nitrogen Doping is a useful tool but there remains a need for more research to determine the actual physics behind it.” The work on the theoretical side of this new technique has to go on even though it seems recipes have finally arrived at a common ground between the different approaches. The scientists used this meeting well to have lively discussions about many different aspects which need to be considered. “Especially for nitrogen-doped cavities, the preparation and cool-down methods are important.”, adds Dan Gonnella, PhD-student at Cornell. “Since nitrogen doped cavities generally show a higher sensitivity to trapped flux than non-doped cavities.” Here measurements and theoretical modelling went hand in hand to search for a more fundamental explanation. In the cryomodule working group different labs presented designs, assembly procedures and worklines for cryomodule assembly including quality control. The assembly of cavities into cryomodules is a vital step for each accelerator and the goal is always to closely maintain the quality of each cavity. Hence the focus of these sessions was to improve already existing procedures and workflows. A good balance has to be found between risk minimisation, which requires frequent interruptions to test the quality, and faster assembly, which means fewer tests. “Even though the big picture of the assembly is important, we also learned that the details cannot be overlooked in all areas,” explains Elvin Harms, scientist at Fermilab working on cryomodule testing for LCLS-II. “Quality control and assurance are absolutely critical.” Even though many details have been discussed for cryomodules, further work is anticipated since installation of cryomodules and of course operation have not yet been fully discussed – topics which have their unique issues. Further sessions focused on couplers and tuners vitally important components. Many different tuner and coupler designs are in use and key details from different designs were exchanged to improve future versions. As the name suggests tuners tune the cavity within the cryomodule to the correct frequency, whereas couplers feed power into the cavity. Several vendors of couplers were present at the meeting and actively participated. The close cooperation between scientists and industry is already well established within the field of SRF. All working groups had industry present. To build as many cavities, couplers, tuners and cryomodules as needed for the recent and possible future accelerator projects mass production is the only solution and therefore the industry must be involved. The first steps have been taken with European XFEL, and now LCLS-II is following as are other projects. “And the TTC supports and encourages free and open exchange of scientific and technical knowledge, expertise, engineering designs, and equipment”, as its mission states. “It is also encouraging to see a strong cooperation between these two projects, European XFEL and LCLS-II, to help build two of the most advanced particle accelerators the world has ever seen,” said Posen. As the host SLAC organised a tour of its facilities. Usually TTC members visit one of the accelerator facilities to get a closer look at SRF technology in use. But this time it was a little different. 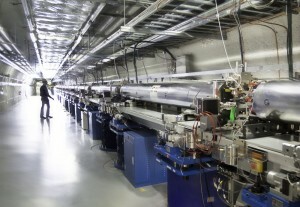 The TTC members visited the experimental halls of the already running light source LCLS. “It was rather delightful to learn for what kind of experiments the beam is used for later since we put so much effort into creating the beam in the first place,” comments Sebastian Aderhold, Postdoc at Fermilab. The SRF technology has matured much in the past 20 years and together with the real industrial progress realised by the European XFEL project which has been presenting the fact that thousands of SRF cavity can be manufactured, tested, and assembled in one region (Europe) in a few years. In a real worldwide collaboration of three regions with twice or three times more, ILC scales could be in reach.